An self-appointed Consumer Watchdog group has issued an advertising campaign questioning Google’s gathering of personal data and attacking its CEO, Eric Schmidt. According to Wired, Consumer Watchdog has hired a veteran journalist called John Simpson (no, not that John Simpson) who is reported to have a deep suspicion of big business, and has had a cartoon-style ad running on the Times Square jumbotron that portrays Schmidt as a creepy ice cream van owning predator. 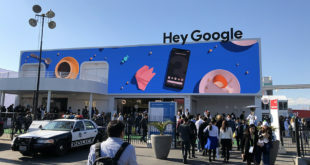 The crux of the argument appears to be that Google gathers inordinate amounts of personal data, however the ad frequently makes a number of unfounded allegations, for example, the ‘Schmidt’ character orders secret service style body scans, tracks viewing habits and, of course, looks through children’s clothes. While it’s true that Google does track surfing to a certain extent, ads are usually served based on the last search term to be entered and are tracked by IP address rather than on a personal basis. Watch the video below to decide for yourself.